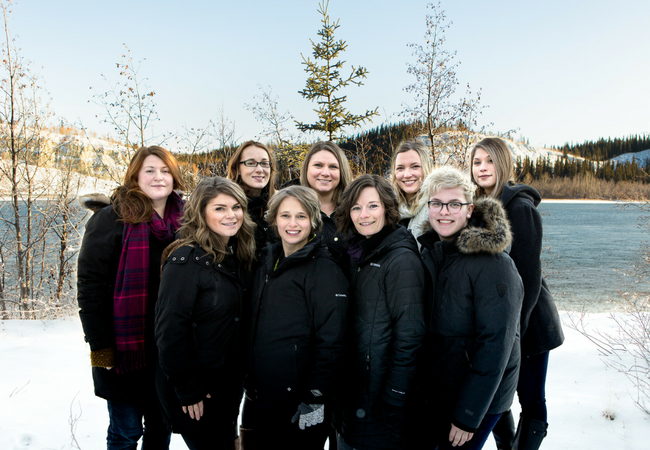 TrueNorth Respiratory was established on December 6th, 2012 by Kristen DeJong and Ashley Kostelnik after a whirlwind year that brought Ashley back home to the Yukon, and Kristen and her family moving up on a whim with a scrap-paper-plan of starting something big together. An opportunity presented itself, and they both agreed that this was their future. TrueNorth opened for business less than a month later on January 2, 2013 in an industrial garage-turned-office. Their goals were to improve upon the respiratory care being offered in the territory at the time by bringing the expertise and perspective of Respiratory Therapists to the Yukon. Business progressively picked up and they added their first administrative staff six months into operations. Another staff member jumped on a few months later, and another one a few months after that. Slingshot forward to present day, and TrueNorth is out of the industrial garage and operating in a new clinic, has a high functioning, compassionate team, and has expanded on their services with best practice in mind, and the ultimate goal of keeping more Yukoners in the territory to manage their respiratory care locally. It was her interest and passion in medicine and patient care that lead Kristen to pursue a diploma in Respiratory Therapy at Thompson Rivers University. Her studies through the program allowed her the opportunity to learn critical respiratory care in a number of settings including St Paul’s Hospital and BC Children’s. After graduation she worked as a clinical Respiratory Therapist at Victoria General Hospital and the Royal Jubilee Hospital. It was after attending a Yukon wedding she soon found herself along with her young family living in Whitehorse. It was a move that fit well right from the beginning. Enjoying running and biking are just a few of the draws the Yukon has offered her. Her work alongside her clients at TrueNorth Respiratory is what drives her to provide the best possible care in sleep and oxygen therapy. It is her goal to continue to try to enhance the availability of respiratory care in the territory. Ashley was born in Whitehorse and has spent most of her life in the Yukon. She knew health care was her calling but couldn't settle on what exactly she wanted to do. She stumbled across a little-known profession called Respiratory Therapy, applied to university, and away she went mostly blind to what the profession had to offer. Following her studies, Ashley happily accepted a position in Victoria, BC and began work as a general duty Registered Respiratory Therapist between both of Victoria's major centres. Always willing to further her education, Ashley quickly accepted additional training on the Respiratory Wards including training to become a Certified Respiratory Educator, in the Bronchoscopy suite, and briefly in a long term care facility assisting patients on long term mechanical ventilation. Ashley always knew she could only be away from the Yukon temporarily. She and her partner returned home for good in early 2012 to the Yukon lifestyle they had missed! Running, yoga, a new puppy, and spending time with friends and her young family keep Ashley busy outside of work. Since joining the Yukon medical community with TrueNorth Respiratory, Ashley’s focus has been on best practice, continual improvement, and striving to offer Yukoners access to the respiratory care and expertise that she has seen the value of firsthand in her experience in BC. Bethan has been a Respiratory Therapist since 2009 working in a variety of health care settings. Studying at Thompson Rivers University and doing clinical rotations in Vancouver, at St. Paul’s and BC Children’s Hospital, ignited a passion in Bethan to help people with their healthcare journey, with compassion and understanding. She has enjoyed both critical and community care and is always eager and driven to improve people’s medical experiences. Bethan loves the outdoors and adventuring. She has travelled and worked around the world, always open to new experiences. While working in Victoria, at the Victoria General Hospital and The Royal Jubilee, she bought a sailboat and taught herself how to sail. Since moving to the Yukon she’s fixed up an old cabin she calls home and is looking for land to buy and turn into a little hobby farm. Bethan loves playing music and is content to never leave the Yukon again (except maybe in Novembers). Bethan is so happy to be a part of the TrueNorth team. She is proud to help people with their oxygen and respiratory needs in the Yukon and to grow Respiratory Therapy as a profession up here. Christina is a coffee-drinking, easy-going-but-specific German-born gal who lives in the Yukon with her three kiddos and her partner. Since starting with TrueNorth Respiratory in 2013, Christina has worked as a Clinical Consultant helping individuals who can't sleep. After completing her certification as a Pediatric Sleep Consultant through the Family Sleep institute she now also works with the exhausted parents of children who won't sleep. Having herself endured many, many sleepless nights, she’s here to show you that the impossible is possible: you can get sleep, with or without small children! Christina is driven by the success of her clients, old and young: being told that a client’s ‘joie-de-vivre’ has returned through her work or having a relieved mom thank her for giving her the ‘gift that keeps on giving’ makes this exactly where she wants to be, every day. When she’s not troubleshooting therapy or consulting about sleep, you can find her gallivanting around in the wild North with her family, running or skiing (or shuffling, at this point!) and indulging the occasional glass of wine with her man. Samantha came to Whitehorse from Winnipeg, MB in 2007. She joined the TrueNorth team as a Clinical Consultant in 2015 focusing largely on helping clients with obstructive sleep apnea transition into CPAP therapy. Having seen some life-changing results, her goal is to help her clients be successful with therapy so they can work towards living a well rested life with more energy. Samantha thrives on professional development and learning new things, and in 2017 she obtained her certification as a Spirometry Technician. Her role with TrueNorth Respiratory has provided her great satisfaction to see the effects of the care and guidance she provides to her clients year after year. Samantha enjoys spending time with friends and family outside of work, working on her car, and is a regular at the gym. Michelle was born and raised in the Yukon. She has her Certificate in Office Administration and has been working in the healthcare field since 2008. She joined the team at TrueNorth Respiratory in August 2016 as a Receptionist. Recently, Michelle has taken on a new role as a clinical consultant, trained in CPAP equipment, CPAP therapy, and home oxygen. She takes a lot of pride in helping her clients get the most out of their therapy. When Michelle is not working, you can find her at the swimming pool or baking up a storm with her partner and three step kids. With over 5 years of business management under her belt and a passion for client care, Samantha joined the TrueNorth Respiratory team as Office Manager in early 2016. She prides herself in ensuring that our clients are well-supported and that they receive the best quality of care possible. The Yukon River runs through Samantha’s veins and you can often find her outdoors camping, fishing and running. Certified as a Spirometry Technician and trained in home oxygen and CPAP equipment and therapy, Samantha prides herself on working to make our beautiful northern community healthier and happier. Kayla moved to Whitehorse in May 2017 from Southern Alberta. Being a graduate from Medicine Hat College's Financial Services program, Kayla moved to the Yukon in hopes of finding a job opportunity related to her studies. It wasn’t long before Kayla was hired by TrueNorth as their Administrative Assistant and has since moved into her role as TrueNorth's Finance Assistant. Kayla has been enjoying the new experiences that both TrueNorth and the Yukon have offered and looks forward to what the future will bring. Paola was born and raised in the Yukon and joined the TrueNorth team permanently in November 2015 as our first Administrative Assistant. She helped create this role at TrueNorth and was able to shape her responsibilities to best support our team, and to keep herself occupied with a wide variety of tasks so her days are fun and exciting. She continues to learn and grow professionally and is a crucial member of the TrueNorth team. Paola enjoys spending her personal time with her family and friends. In the summer she disappears each weekend to go camping and fishing, and, most recently, she has taken up skiing to keep herself active in the winter. Lorna moved to the Yukon in April 2018 to join family and the TrueNorth Team. She is a mother of two awesome adult children. Lorna comes to us with more than 35 years work experience, including working as an office manager for a busy chiropractic office. Lorna loves being able to help people live the best lives they can and always has a listening ear and a welcoming smile.